Cumulative updates have been released by Microsoft for Windows 10 April 2018 Update (version 1803), Windows 10 Fall Creators Update (version 1709), and Windows 10 Creators Update (version 1703). See the update appropriate for your version of Windows 10 for the Improvements and fixes as well as Known Issues. Oracle released the scheduled critical security updates for its Java SE Runtime Environment software. The critical patch update contains 8 new security fixes for Oracle Java SE. All of these vulnerabilities may be remotely exploitable without authentication, i.e., may be exploited over a network without requiring user credentials. Microsoft released new cumulative updates for the Windows 10 Version 1703 and Version 1803 to introduce a series of quality improvements. No new operating system features are being introduced in this update. A restart is needed to install the update. Pale Moon has been updated to version 27.9.4. The release includes DiD ("Defense-in-Depth") changes. This means that a fix does not apply to a (potentially) actively exploitable vulnerability in Pale Moon, but prevents future vulnerabilities caused by the same code, e.g. when surrounding code changes, exposing the problem, or when new attack vectors are discovered. The July security release consists of 53 CVEs, of which 18 are listed as Critical and 33 are rated Important, 1 is rated as Moderate and 1 is rated as Low in severity. The updates address Remote Code Execution, Security Feature Bypass, Elevation of Privilege, Denial of Service, Tampering, Information Disclosure, and Spoofing with known issues for 4338825 and 4338818. Even though on vacation, Dustin Childs dedicated time to provide a closer look at some of the patches for this month in Zero Day Initiative — The July 2018 Security Update Review. Although he indicated "None of the bugs patched this month are listed as publicly known or under active attack at the time of release." his evaluation is definitely appreciated. Adobe has released Version 30.0.0.134 of Adobe Flash Player. In addition to functional issues, the update address critical vulnerabilities that could lead to remote code execution affecting version 30.0.0.113 and earlier. Reader DC and Acrobat DC were updated to version 2018.011.20055. Update checks can be manually activated by choosing Help > Check for Updates. Mozilla sent Firefox Version 61.0.1 to the release channel today. It does not appear that Firefox ESR has been updated. Congratulations! Thank you for your continued contributions to the Windows community, we are excited to re-award you as a Windows Insider MVP. This award is a token of our appreciation, your leadership and passion help make Windows the best yet. 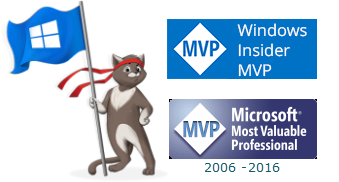 We look forward to our on-going collaboration with you and all of our Windows Insider MVPs as we continue to strengthen the Windows Insider MVP (WI MVP) Program.